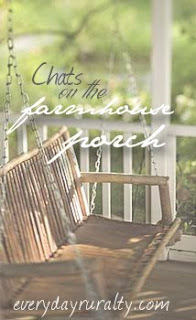 Everyday Ruralty: Chats on the Farmhouse Porch 19 - Sorry I kept you waiting! Chats on the Farmhouse Porch 19 - Sorry I kept you waiting! I'm sorry I'm late posting our weekly chat. The dog ate my homework. Umm? I ate too much at the Thanksgiving feast and I've been comatose for days. No. Hmm?? I was cleaning out my art studio so C.S.Farmer could finish the drywall. My, my! The other answers were much more interesting. I want to thank Wendell for visiting with my friends until I could join the group. He told me that he got refreshments for everyone. He said that you didn't enjoy the hay, so he ate it. He remarked that you might have enjoyed carrots more, but he couldn't get the refrigerator door open. I would like to have a little card/gift exchange with anyone who has ever joined in on the "Chat". I will match people up and take a name for myself. Please e-mail me and let me know that you are interested. Please specify if you wish to exchange just cards, or a small gift of some type. If you are not interested, you need not do anything. (email: patrice@everydayruralty.com) This is only open to those who have been part of the "Chats" up to this point (either linked or answered in comments). Thanks! No, Wendell. They won't be sending you carrots. No apples either. Is there a Christmas Carol that's special to you? Is there an art or craft that you'd love to be able to do? Do you have a live Christmas tree or an artificial one? I have always liked Thursday. I'm not really sure why. I guess it's a bit more relaxed than earlier in the week, but not as busy as the weekend. When I was a school girl, I liked Friday because I knew I would have a few days off. When I worked, it never really mattered, because I've rarely worked jobs with a normal week. I liked the Polar Express. The music is wonderful! I love Silent Night. We have a beautiful stained glass window with Jesus on it in our church. Christmas Eve, the lights in the church are dim and the light behind the window makes its colors illuminate the room, while we sing Silent Night softly. It's really quite lovely. D2 has learned In the Bleak Mid-Winter on the harp. She sings it too. I really enjoy that one too. I used to be a potter, but I cannot afford the equipment to get back into it and I can't make it to the shared studio I used to use. It's to costly to travel there. One day! We have an artificial tree because of allergies. I love the real ones, but they can be messy when the needles drop all over the floor. We have a huge Spruce Tree outside that I want to decorate one year. I'd like to make bird friendly ornaments, like peanut butter pine cones rolled in seed. As much as I'd like to do that, we have way to many farm cats who would spoil the idea. I wanted to show you the art that I've been busy with. I've made many of these ornaments. They are hand made and each take a boatload of time. Each ornament starts with the seed I plant in the greenhouse. After the pods are harvested, I dry them out and sculpt the face with clay. (These are copyrighted- for all of you guys in factories around the world who haven't an original idea .) So, Patrice- Tell us what you really think. I will do my Chat a bit later. I hope you are doing okay. I wondered what you have been doing. I have been too sick lately. I think an exchange is a great idea! That should be lots of fun! 1. Now that I'm retired I don't have a specific favorite day. Any day where I accomplish something that leaves me feeling satisfied is probably my favorite day. 2. The one that comes to mind is Prancer. 3. I like most of them... but not before Thanksgiving! Our school used to do a cute little pageant with "The Friendly Beasts". I still like that carol, perhaps because it isn't played that often! 4. I'd love to be able to paint. 5. We've had an artificial tree for a few years, since we haven't been home for the holidays. Next year we plan to stay home (I'm hoping) and we'll probably have a live tree that we can plant in the spring. I really enjoy this hop! Thank you, Patrice! You & Wendell are favorites! I will do an exchange! I will play along next week! I think that your ornament is adorable! I had to get the wedding pix up so I didn't link up today. I did, however, put your link on my post so others might come over for a chat! 1.Wednesdays- because that's when the college group comes over for dinner! When the girls were little, it was Friday because it was the last day of school for the week and the weekend was here! 2. That's impossible for me to narrow down- A Christmas Carol (all versions); Christmas Vacation; Love Actually; The Bishops Wife; A Christmas Story; etc. I just can't narrow this one down! 3. I really like them all but I do have two favorites: I Came Upon a Midnight Clear and O Holy Night. I loved hearing my dad sing those when I was little. 4. Yes, quilting. I would LOVE to quilt. 5. We go artificial on both because of the year we had TWO live ones die on us! Oh shoot! 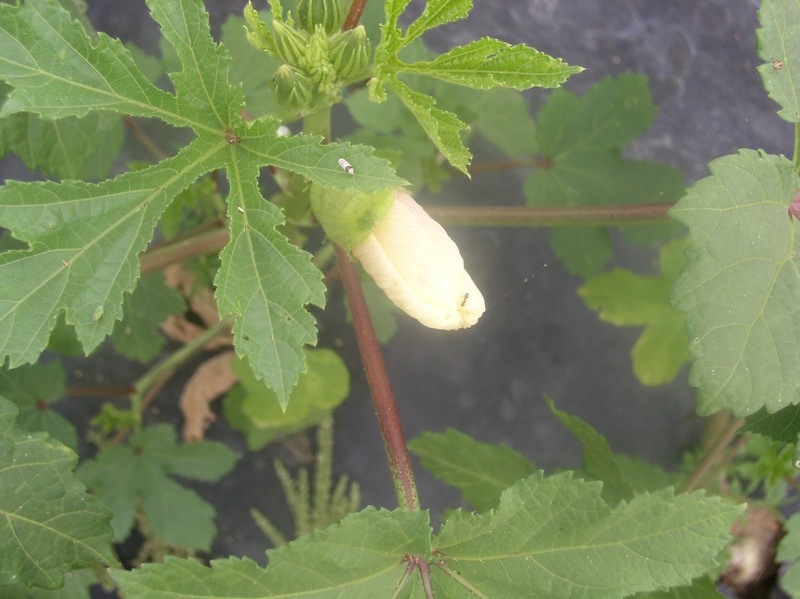 I forgot to tell you how much I ADORE that okra Santa! And please give Wendell a hug from me! And some carrots! How clever you are making that cute ornament. You should probably try to sell them. I'm sorry for getting back to you so late. I'd love to do an exchange. Count me in for gift or card...whatever!! How adorable! WE have been crazy here with Bear and Tink's birthdays (Tink's was the 30th) and 80 new calves, and the girls' school's Christmas Bazaar last weekend that I was baking for in between tending to calves and hosting birthdays fests! OYE! I would love to exchange a card or small gift with someone. 1. I used to have a favorite day, Saturday, but with farming, my new favorite day is any warm sunny day or any day my farmer can come in and spend some time with his girls. These days are starting to come back. 2. I think my favorite Christmas movie is the old one with Cary Grant playing an Angel to Loretta Young...dang what is the name of that..... The Bishop's Wife. LOVE it! 3. I truly love them all. I have sang so many over the years in choir, but I think Away in a Manger and O Holy Night are my two fav's with Silent Night always bringing a tear to my eye on Christmas Eve. 4. Wish I was a better knitter and would follow instructions better when I crochet. I usually just do my own thing, but I love all the different patterns my mom makes! 5. Artificial for my mom (she's allergic to something in the tree, chlorophil (sp?) I think).